Here is the reading for the next Politics of Debt meeting – OMNI basement. We will continue on with Ellen brown’s Public Banking solution on the topic foreign policy and other countries’ use of Public Banks. The next Taser-free Berkeley organizing meeting. PUBLIC FORUM: SHOULD BERKELEY POLICE USE TASERS ON THE PEOPLE OF BERKELEY? Meeting of the City of Oakland’s “Privacy and Data Retention Ad Hoc Advisory Committee” – open to the public. Repression and the Criminalization of a Generation! YOU ARE INVITED TO THE NEXT BAY AREA STRATEGY MEETING for the October Month of Resistance to Mass Incarceration, Police Terror, Repression, and the Criminalization of a Generation. People in Ferguson have repeatedly stood up in righteous rebellion to stop police terror! They have refused to back down in the face of dogs, tear gas, guns, and tanks. They are fighting back and simply demanding justice for Michael Brown — demanding these cops stop murdering young Black men. Here in the Bay Area, people have taken to the streets day after day to demand justice for Michael Brown and the many other victims of police murder, locally and nationally. The determined struggle of people is what’s changed the terrain throughout the U.S. This struggle has reverberated internationally. And, right now is time to step up the struggle; to take it to a HIGHER level; to involve a greater breadth of society. These very serious demands�to namme, indict and jail the cops who killed these people — have to be met now, not next week or next year. Look at the reality of America: 1 in 3 Black male children born after 2001 will spend some time in prison in his lifetime. The US has 5% of the world’s population, but 25% of the world’s prison population and 35% of the world’s female prisoners! 2 million immigrants have been deported in the last 6 years, with 400,000 in detention each year. The U.S. is the only country in the world that sentences adolescents, children, to spend the rest of their lives in prison. These and many other horrors make clear the level of resistance to mass incarceration, police terror, repression and the criminalization of a generation needs to be taken to a much higher level. THIS MUST STOP… AND THAT IS UP TO US. All that’s happened these last couple of weeks make urgently clear the need to seriously step up resistance and that mounting resistance is the only way things will change. Who needs to be at this meeting? You need to be at this meeting! At this meeting we will plan out many events, including (but not limited to) Faith Community Weekend against Mass Incarceration on Oct 3,4 and 5th, the protests for “Not One More Deportation!” on October 13th, the stops in the Bay Area of Dr. Cornel West and the big demonstration in Oakland on October 22, along with cities all across the country – as one part of a making October 2014 as powerful as possible. The college campuses, faith community, neighborhoods, and the culture and art scene all need to be holding events and taking action in October… we will further strategize and plan this out, with the objective of October 2014 making clear tens of thousands are willing to stand up and speak out today to awaken and rally forth millions. We should invite one and all via email, Twitter, phone calls, Internet postings, ads and PSA’S. While there are different understandings of why this is happening and what should be done about it, we need to unite all those who agree this must end to act together in October 2014. October will give all those who want to stop these horrors a vehicle to be part of doing just that and the actions of tens of thousands of us in October will challenge millions more people to stop closing their eyes to these horrors and join the resistance to them. The next meeting will be one week from today, September 8th. Meeting with Program featuring Norman Solomon of Roots Action! Zaki Manian of Restore the 4th on state & natl legislation. 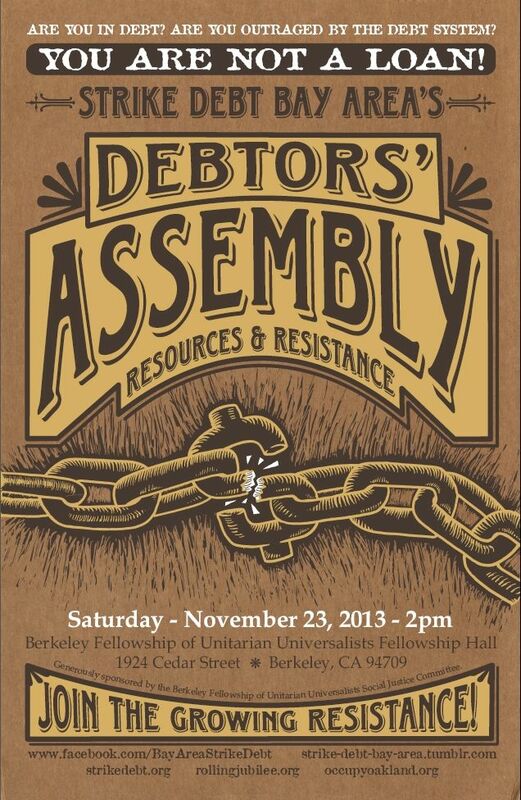 Come and help us draw awareness to and fight unjust debt! Also check out our website, our twitter feed, and our Facebook page. Information, discussion & community! Monday Night Forum!! Occupy Forum is an opportunity for open and respectful dialogue on all sides of these critically important issues! This Thursday, more than a dozen Bay Area citizens (our comrades from Sunflower Alliance, OccupyOakland, and others in this affinity group) chained themselves to a gate at the Kinder Morgan rail terminal in Richmond to stop operations. The citizens risked arrest to protest mile-long oil trains that threaten the safety of area residents and are a massive new source of air and carbon pollution in the region. Among the demonstrators were residents of Richmond, Rodeo, Martinez, and Benicia, all towns that currently see dangerous oil trains moving through residential areas. Earlier this year the regional air quality agency, known as the Bay Area Air Quality Management District, changed an existing permit to allow oil trains at the rail facility. Demonstrators contend that the agency broke the law when it modified the existing permit without additional environmental and safety review. “Bomb Trains” are an environmental justice issue, a climate issue, and one of the most reckless, heedless gambits Big Oil has thrown our way. In honor of our sisters and brothers who are leading the way for us all in the Bay Area and around the country, OccupyForum will screen the film “Just Do It – A Tale of Modern Day Outlaws” by Emily James. The documentary follows climate activists as they blockade factories, attack coal power stations and glue themselves to the trading floors of international banks despite the very real threat of arrest and abuse. It seems the time has come for everyone who can muster up the courage to put our bodies on the line. Discussion and Announcements will follow. Berkeley Post Office Defenders General Assembly. The Postal Service outsourced Post Office services to Staples, replacing union jobs with low-paying, low benefit work. Come help us plan our next steps. On July 29th, at our invite, Ralph Nader spoke on the steps of the Berkeley Post Office against privatization and corporatism. Watch and listen to his talk here. We’ve began the “Don’t Shop at Staples” campaign with some awesome… what else? … postcards to send to Staples management! Here’s the front of the postcard. The campaign has been adopted by Postal Unions, the San Francisco Labor Council and has been endorsed by the AFL-CIO, and has gone national! All four Postal Unions have joined together to support maintaining full service, public Post Offices in every community, with expansion to include postal banking, and to oppose subcontracting and privatization of services. The California Federation of Teachers passed a resolution in support of opposition to Staples. Just recently the American Federation of Teachers, AFCSME and UNITE HERE did too. Check out our correspondence with the President of the American Postal Workers Union, Mark Dimondstein. The APWU has been leading the charge against Staples. For most of July the sidewalk in front of Staples was ‘occupied’ 24/7 by an intrepid band of San Francisco occupiers with solidarity and support from BPOD members distributing literature and convincing people not to shop at Staples. They’re back! Come hang out with them outside Staples at Durant & Shattuck. And we need to be prepared if the Post Office announces a sale! The Advisory Commission on Historical Preservation came out with its report, recommending that sales of Historic Post offices be halted until the USPS conforms with historical preservation law. Here is our response. Also the Office of Inspector General’s report on the sale of Historic Post Offices came out recently – anything could happen now since Congress’ “request” that no historic Post Offices be sold until it had come out has been honored and no further Congressional request or mandate has come down. Come help us plan our response. We have joined with other activists in Berkeley to put a ballot initiative on the ballot to rezone the Berkeley Post Office and other areas in the Historic District to prevent privatization, and also to insure a better Downtown Berkeley. We succeeded in getting the necessary signatures; it will be voted on in November, but Tom Bates and the City Council have nefarious plans to undermine our coalition. The Berkeley Planning Commission passed a similar zoning ordinance (finally) on August 27th. It will go before the City Council on September 9th. Encouraging articles are still coming out about using Post Offices as banking facilities for the unbanked. The National Conference of Mayors recently endorsed Postal Banking. Pew Research held a day-long seminar on Postal Banking. The Postal unions and other groups have announced plans for a conference on postal banking in November. We are planning our next event, ‘Jam the Sale.’ Spread the work and come help us out! AND CHECK OUT OUR WEBSITE. Let’s fill the room and make sure the Ordinance – more than a year after it was proposed – gets passed! It will rezone the downtown Historic District to prevent usages of the buildings or land for other than civic purposes, thereby rendering a sale of the Post Office or the other historic buildings around the downtown park to a developer not worth it to the developer, who won’t be able to build a twenty story office building with a McDonald’s at street level. Come lend your support and speak about preserving the public commons! If you have never come before, come and get involved! If you have been participating, come and get re-energized! Although we have made tremendous gains, the fight is not over. We are still fighting for the college we want and the college all of our students deserve. We agree with the City Attorney who says that the issue at City College is the principle of open access education for all versus success for a few. Restoration, the legal suit, Board of Trustee status and elections, etc. Keep our college a community college! Reports from students, lobby committee, etc. Brainstorming for activities of Coalition for Fall and beyond. We began the “Don’t Shop at Staples” campaign with some awesome… what else? … postcards to send to Staples management! Here’s the front of the postcard. The campaign has been adopted by Postal Unions, the San Francisco Labor Council and has been endorsed by the AFL-CIO, and has gone national! All four Postal Unions have joined together to support maintaining full service, public Post Offices in every community, with expansion to include postal banking, and to oppose subcontracting and privatization of services. The California Federation of Teachers passed a resolution in support of opposition to Staples. The American Federation of Teachers, AFCSME and UNITE HERE did too. We have joined with other activists in Berkeley to put a ballot initiative on the ballot to rezone the Berkeley Post Office and other areas in the Historic District to prevent privatization, and also to insure a better Downtown Berkeley. We succeeded in getting the necessary signatures; it will be voted on in November, but Tom Bates and the City Council have nefarious plans to undermine our coalition. The Berkeley Planning Commission passed a similar zoning ordinance (finally) on August 27th. It will have gone before the City Council on September 9th. BPOD is an offshoot of Strike Debt Bay Area, an offshoot of Occupy Oakland and a chapter of the national Strike Debt movement, which is an offshoot of Occupy Wall Street. Or next Politics of Debt meeting will be a presentation by Chong Kee Tan on Bay Bucks, a local alternative currency. We’ll hear him speak and then have a Q&A period, perhaps leasing into a broader discussion. Or next meeting will be one week following, on September 24th, instead of two. We’ll discuss chapters 21-23 of Ellen Brown’s Web of Debt. We began the “Don’t Shop at Staples” campaign with some awesome… what else? … postcards to send to Staples management! Here’s the front of the postcard. The campaign has been adopted by a large number of national and local unions, including teachers’ unions and the AFL-CIO. For almost three months the Berkeley Staples has been ‘occupied’ 24/7 by an intrepid band of San Francisco occupiers with solidarity and support from BPOD members distributing literature and convincing people not to shop at Staples. They’re still there! Come hang out with them outside Staples at Durant & Shattuck. We have joined with other activists in Berkeley to put a ballot initiative on the ballot to rezone the Berkeley Post Office and other areas in the Historic District to prevent privatization, and also to insure a better Downtown Berkeley. We succeeded in getting the necessary signatures; it will be voted on in November, but Tom Bates and the City Council have nefarious plans to undermine our coalition. The City Council passed the ordinance in a first reading on September 9th. The 2nd reading is September 30th. Save CCSF Coalition General Assembly. @ Mission Campus, CCSF; Room 107/108. Save CCSF Coalition General Assembly: Hear about about Restoration status, the legal suit, Board of Trustees status and elections, etc. Plus update on Alex Nieto case. WE DID IT! AFTER 14 MONTHS OF WORK, THE ZONING OVERLAY ORDINANCE PASSED ON SEPTEMBER 30th. Read more about our victory here. 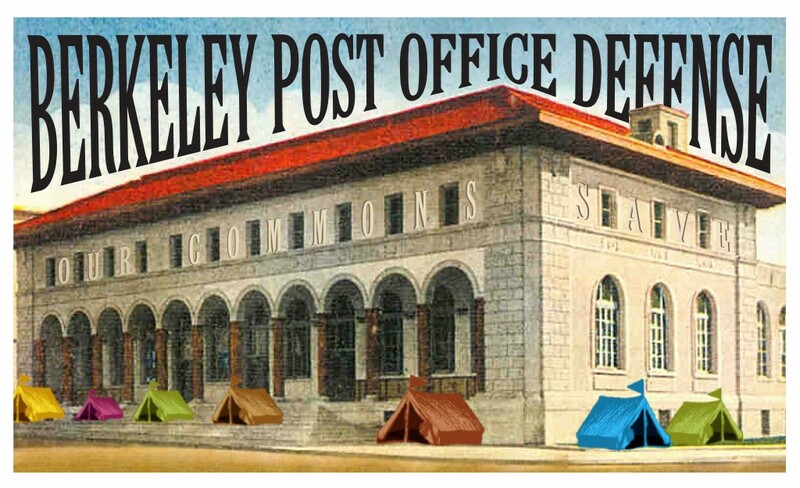 Nonetheless the Postal Service still has the Berkeley Post Office up for sale!! And the Postal Service outsourced Post Office services to Staples, replacing union jobs with low-paying, low benefit work. We’re still fighting against both! For three months the Berkeley Staples has been ‘occupied’ 24/7 by an intrepid band of San Francisco occupiers with solidarity and support from BPOD members distributing literature and convincing people not to shop at Staples. They’re still there! Come hang out with them outside Staples at Durant & Shattuck. The Advisory Commission on Historical Preservation came out with its report, recommending that sales of Historic Post offices be halted until the USPS conforms with historical preservation law. Here is our response. The Post Office has ignored the report, recently selling historic Post Offices in The Bronx and Burlingame, CA. We need to be prepared if the Post Office announces a sale! We have joined with other activists in Berkeley to put a ballot initiative on the ballot to cement the rezoning of the Berkeley Post Office and other areas in the Historic District to prevent privatization, and also to insure a better Downtown Berkeley. (The City Council could undo what they just wrought at any time; a ballot initiative become law can only be undone by another vote of the people). BPOD is an offshoot of Strike Debt Bay Area, which itself is an offshoot of Occupy Oakland and a chapter of the national Strike Debt movement, which is an offshoot of Occupy Wall Street.